Is there an article of clothing more popular than the T-shirt? Chances are you’re wearing one right now. (Feel free to check.) But there’s more to the T-shirt than meets the eye. In this guide, we venture between the sleeves to help you find the best possible tee. Keep reading for expert advice on finding the best T-shirt. The T-shirt started as underwear. In the late 19th century, navy sailors would slice their “union suits” at the equator, adapting them for summer wear. The more comfortable tops were easy to wear―and in 1913, the US military formally adopted an evolved short-sleeved version, in cotton, as an official undergarment. Two factors turned the T-shirt from an “unmentionable” to near ubiquity. The first were soldiers. 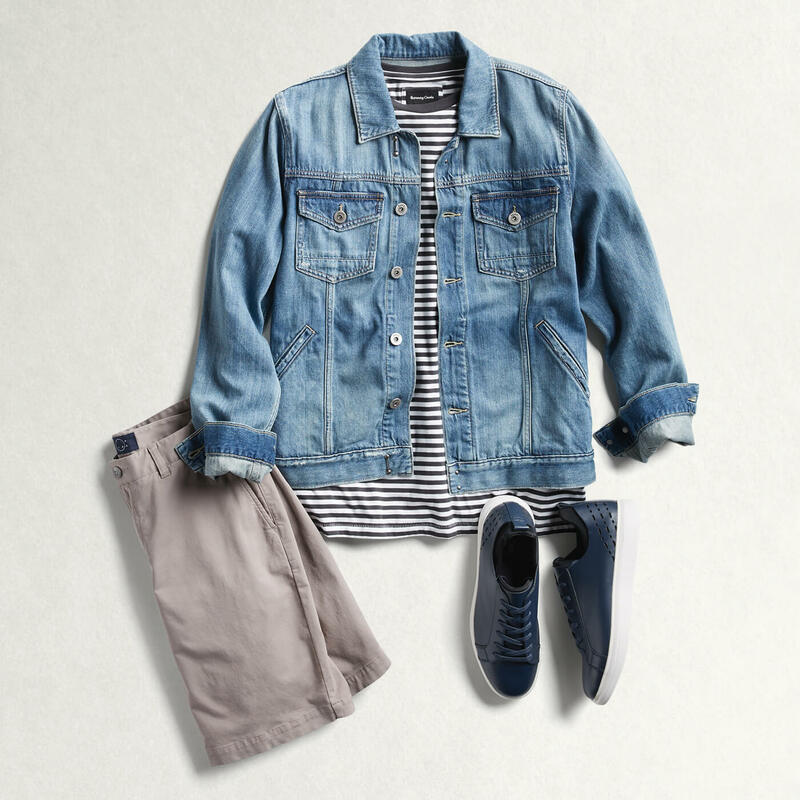 Having gotten used to wearing just T-shirts with their uniform pants, men continued the habit when they returned from World War II. The July 13, 1942 issue of LIFE Magazine might just be the first photo of a printed tee in popular culture. The second factor was star power. In 1951’s A Streetcar Named Desire, Marlon Brando spent most of the film in a white undershirt. Audiences swooned and the plain white tee went from underthing to “overthing”, overnight. T-shirt Fact: F. Scott Fitzgerald was the first writer to use the term “T-shirt” in his novel, This Side Of Paradise. 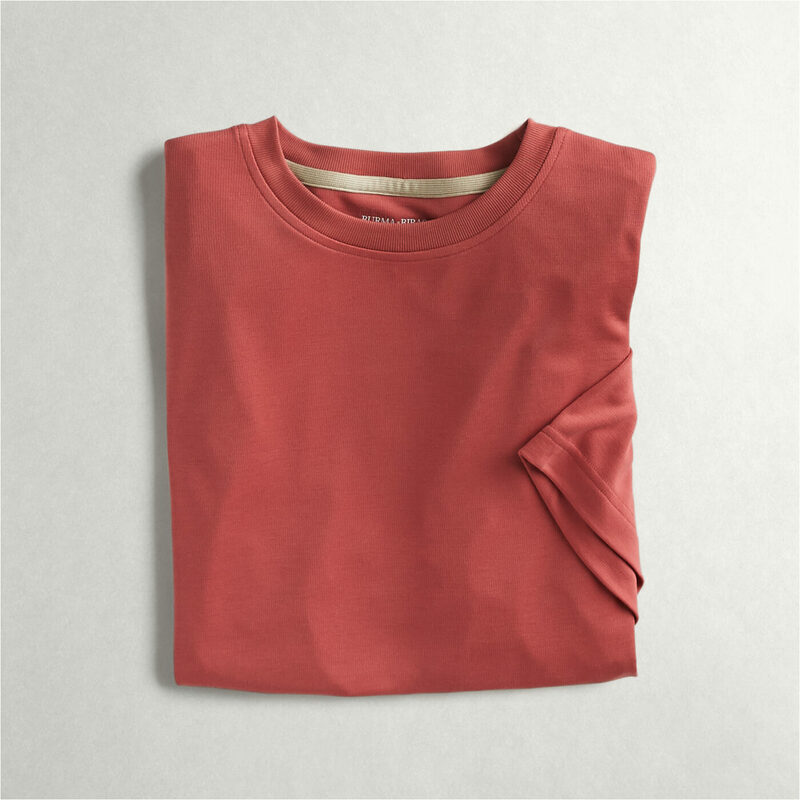 For a seemingly simple garment, T-shirts come in a variety of styles, textiles, designs, and fits. But the primary way to designate shirts is by their neck type. 1. What is a crew neck? An homage to the T-shirt’s nautical origins, the crew neck is the default tee shirt. It features a round neckline that fits tightly around the base of the neck, forming an O around the head. 2. What is a V-neck? The V-neck was introduced so that people wouldn’t see white undershirts when a man unbuttoned the first few buttons of his overshirt. Today, the V-shaped collar is a feature of its own, and adds visual interest. 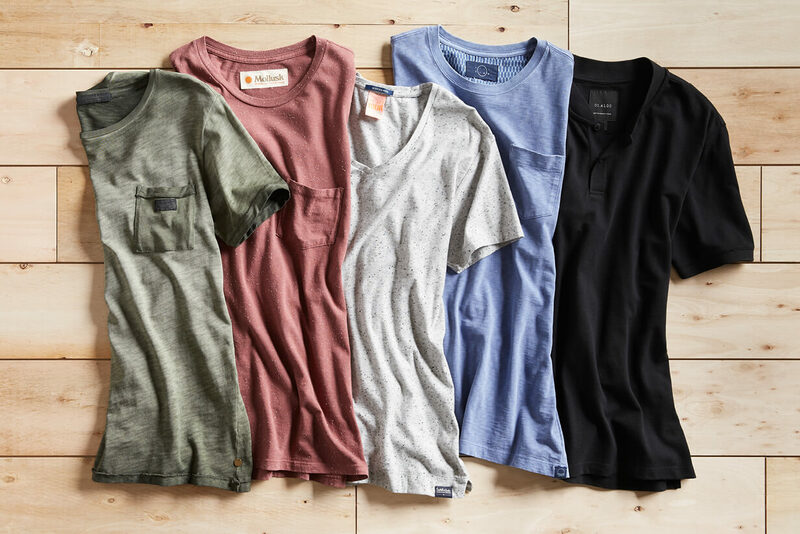 T-shirts might be the most challenging item in your closet to fit properly. It’s true. Too tight and a T-shirt will cling to you and emphasize your body in the wrong ways—but too loose and it will dangle around you like a nightgown. Here are the parts—your parts—where fit matters most. Your T-shirt’s sleeves should hit at the midpoint of your upper arm. That said, if you’re very tall or have longer arms, a sleeve that cuts lower can work. If you have shorter arms—or huge guns—shorter sleeves can nicely emphasize your biceps. Tees are a challenge for the long torsoed gentleman. If you’re a tall or skinny man, please fight any temptation to wear an XXXXL tee. Yes, it might be at the right length, but you’ll disappear in its billowy folds. Instead, look for a long line cut that can cover you without looking boxy. T-shirts should fall just below your belt. If a shirt touches the bottom of your fly, it’s too long. The majority of men have have rounded sloping shoulders—not square ones like Superman. One way to balance round shoulders is with a v-neck collar, since this makes your shoulders look more broad. Another tactic is to wear a tee with contrasting sleeves. Regardless of your body type, always make sure the seams of your shirt line up with your shoulder line. Until they invent a shirt that magically bestows six-pack abs on its wearer, you’ll want to be mindful how a shirt fits around your midsection. Your shirt shouldn’t feel painted on, nor should it drape around you like a mumu. When in doubt, choose a size up in a slim cut. Thanks to pioneers like Marlon Brando and James Dean, you can wear underwear in public. The true original is the white tee. It will coordinate with just about anything you throw at it—except mustard, so be careful with that hotdog. Navy always looks sharp, and isn’t as bold or imposing as black. 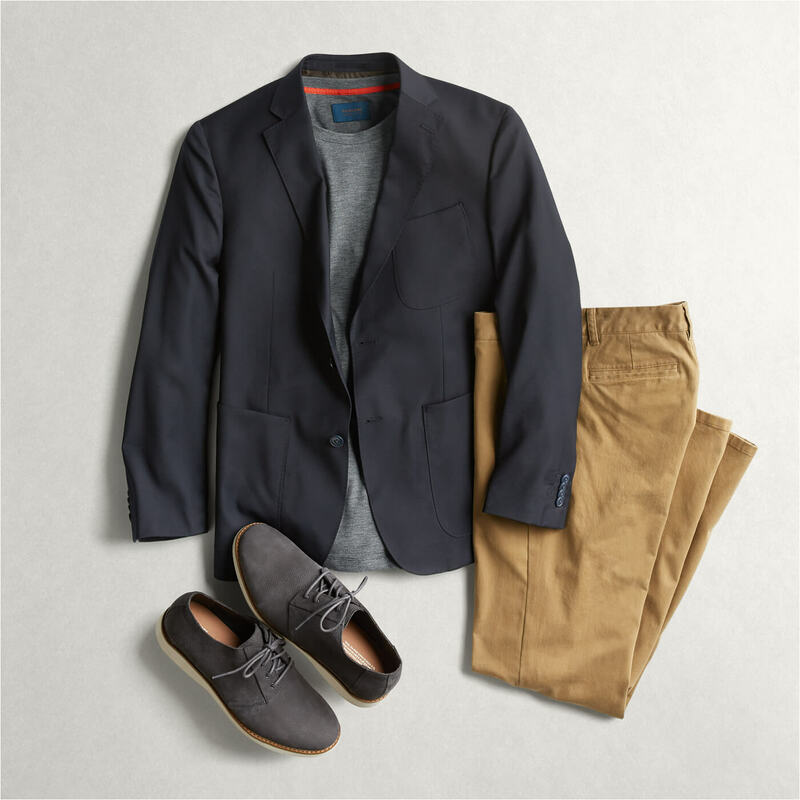 Pair a charcoal blazer over a navy T-shirt for a smart casual look. Gray is usually flattering, but remember: there are many shades of gray. 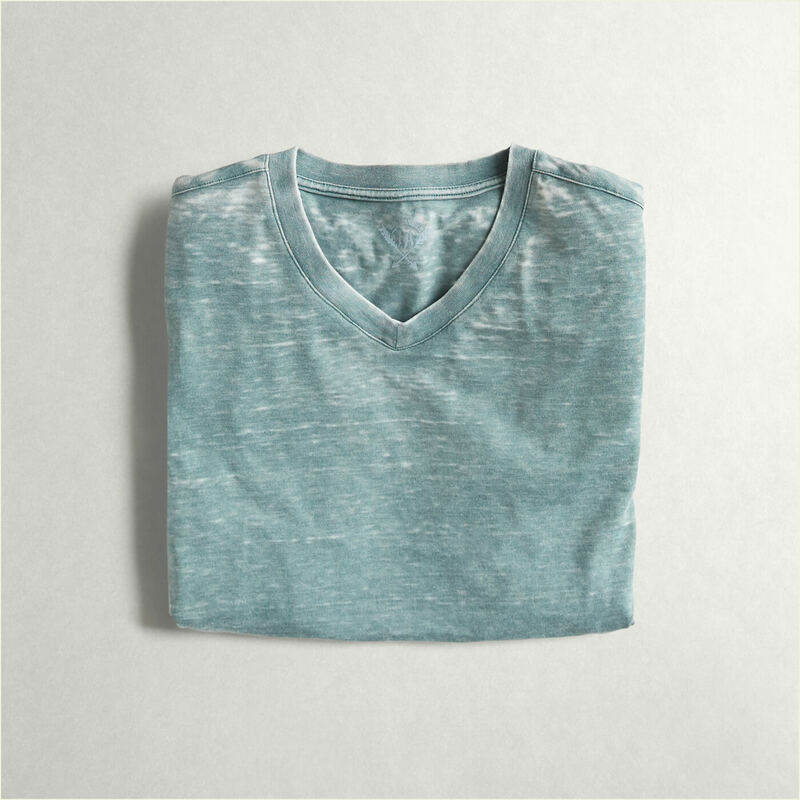 Light gray can telegraph sweat stains, but coordinates easily with other colors. 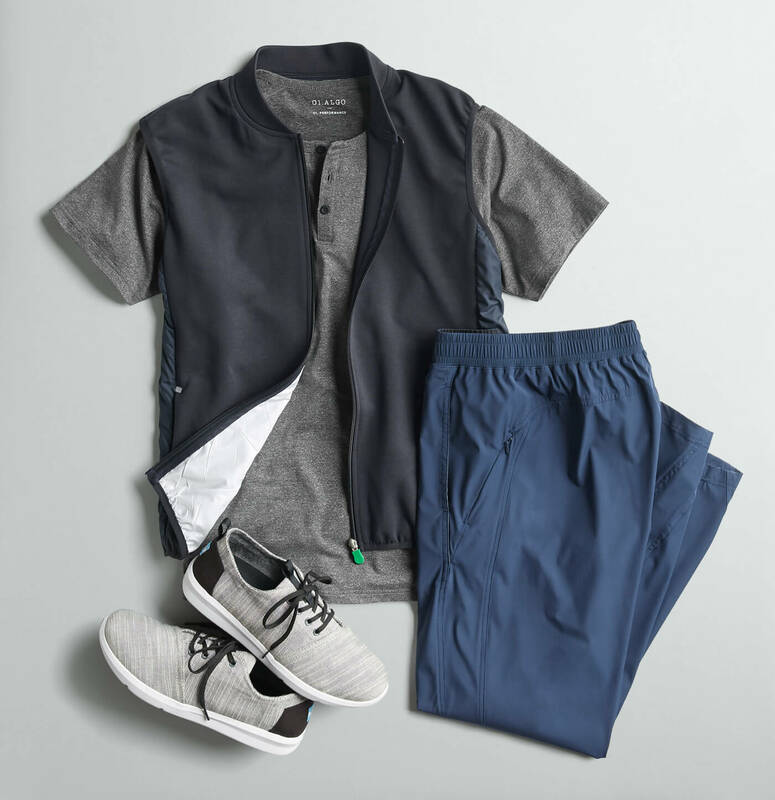 Darker grays look sleeker but are harder to match, especially with other dark colors. Black: the favorite of punkers and graphic designers. Though naturally slimming and perfectly neutral, black can be challenging to wear. It should be avoided with very light skin tones, or any blacks that are similar-but-not-quite-the-same shade. 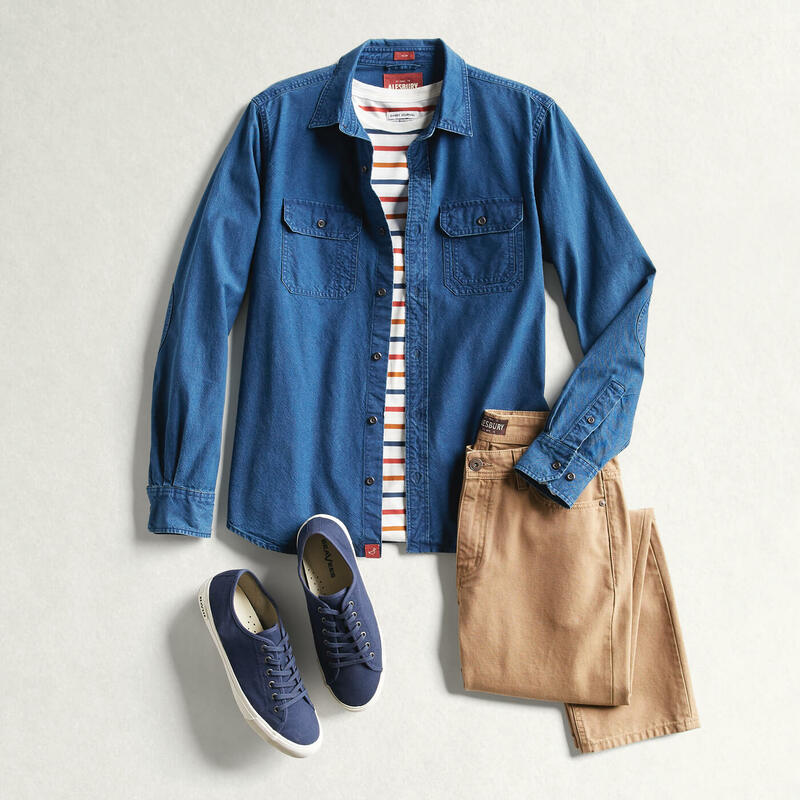 Stylist Pro Tip: Don’t wear a blue T-shirt with blue jeans; it’ll work better with khakis. 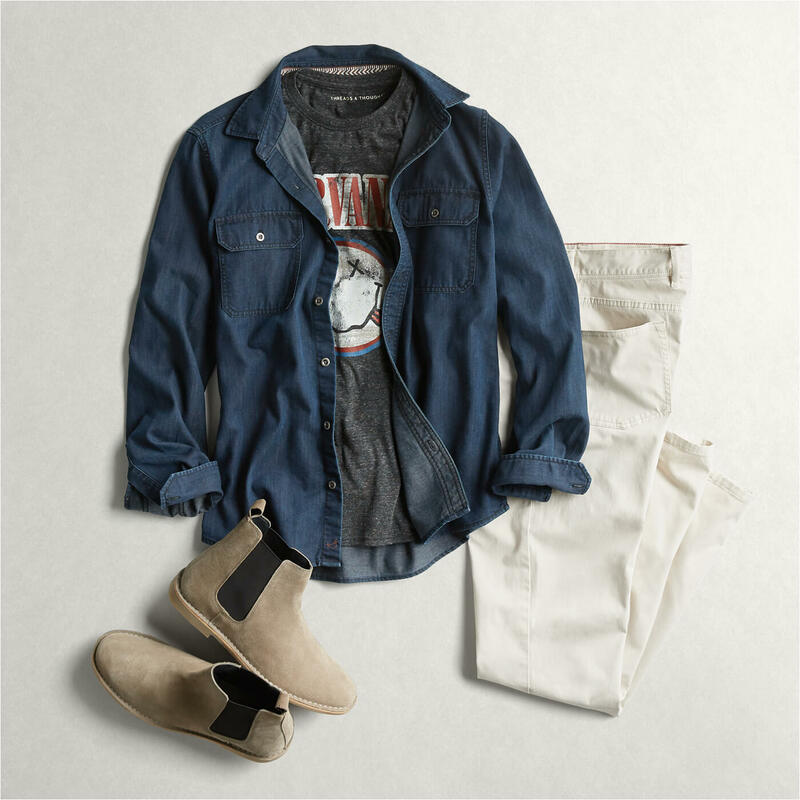 Whether it’s a faded band logo or your favorite restaurant back home, graphic tees have an undisputed place in men’s casual style. Wear shirts that authentic, casual, and appropriate for the occasion. The classic. When most people think T-shirt, they are probably thinking about a worn out cotton tee with a faded band logo in the center of it. Keep it authentic—your favorite college, band, sports team, clothing brand, or restaurant/bar—and wear it proudly. These shirts will only get better with time as they fade. Just make sure you wear it in the right setting (nobody likes the guy wearing a faded T-shirt at a Michelin-starred restaurant). T-shirts with a graphic design give you a chance to express yourself. Whether it’s a colorful print or piece of ironic artwork, try to find a design that you feel a connection with. Pro tip: steer clear of overly chaotic or “in your face” designs to avoid the Ed Hardy look. Baseball tees—shirts that have a three quarter length sleeve that is typically in a different color—are are a staple of the casual look. They usually have the logo of an actual baseball team (go figure), brand logo, and everything in between. 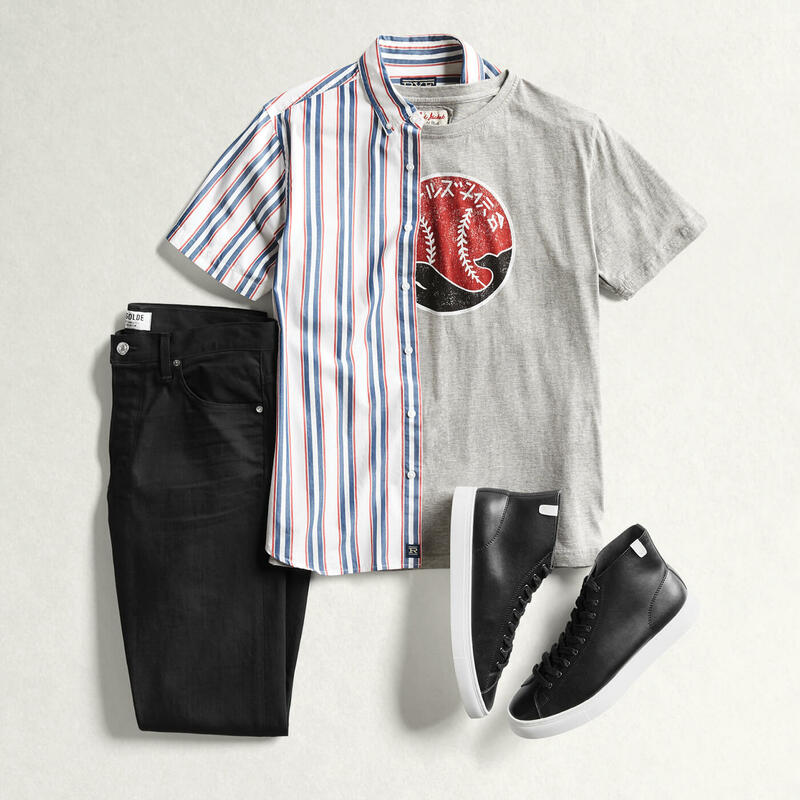 From throwing around a football to fixing up a classic car (or just looking like you are), these shirts paired with jeans will give you a laid-back and timeless look. Patterns add visual interest to a shirt, but that’s not all they do. They can change the shape and texture of your clothing and give you personality. Here’s what you need to know. Use stripes to draw attention to a part of your body. A single horizontal stripe across your chest, for examples, can make it seem bigger. It can do the same for your gut though, so proceed with caution. Vertical stripes make a man look taller by drawing the eye up and down the body. Use them to downplay a short torso. A repeated print or emblem on a T-shirt is an easy way to dress up the shirt a bit and make it less casual. A neutral print on a black or white tee can even work with a blazer, and some colorful prints give your shirt some personality without looking juvenile. A T-shirt with a free-flowing design like floral, tribal, or motif patterns will make your shirt a statement piece that can easily stand alone and complete your outfit. 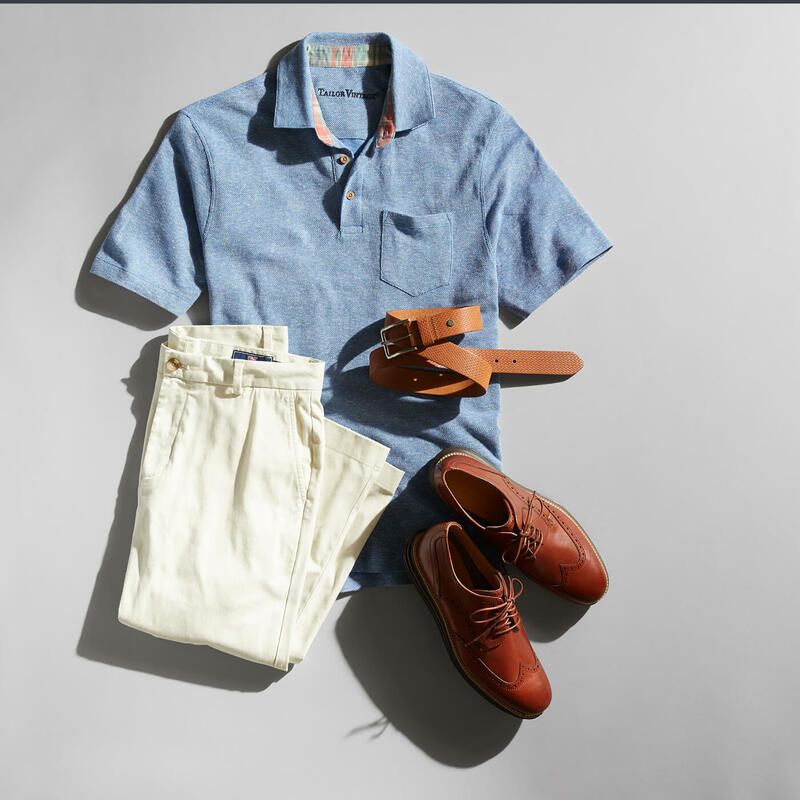 Pair these types of shirts with denim jeans or plain, neutral colored pants and shorts to avoid clashing. Need help deciding which t-shirt style is best for you? 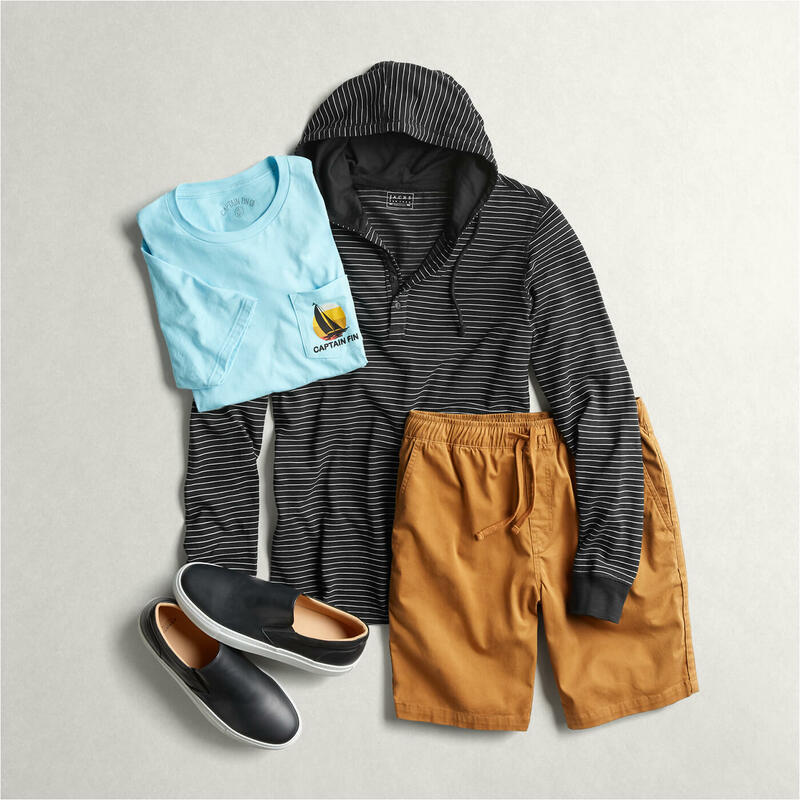 Ask a Stylist and get the right look sent to you.